Origami. A voice that popped up in my head a few months back. I tore some paper out from a register and tried my hand at attempting to create something (what exactly, I now forget) out of nothing. But the paper was rectangular, thick, and lined – not right for origami. I forgot all about it till I chanced upon a set of colored origami sheets on Amazon as I explored stationary and craft supplies to fill the hole in me that only creating something seems to fill. They arrived soon, perfect little squares in all colors of the rainbow. I went on youtube and my first attempt was a red dress. 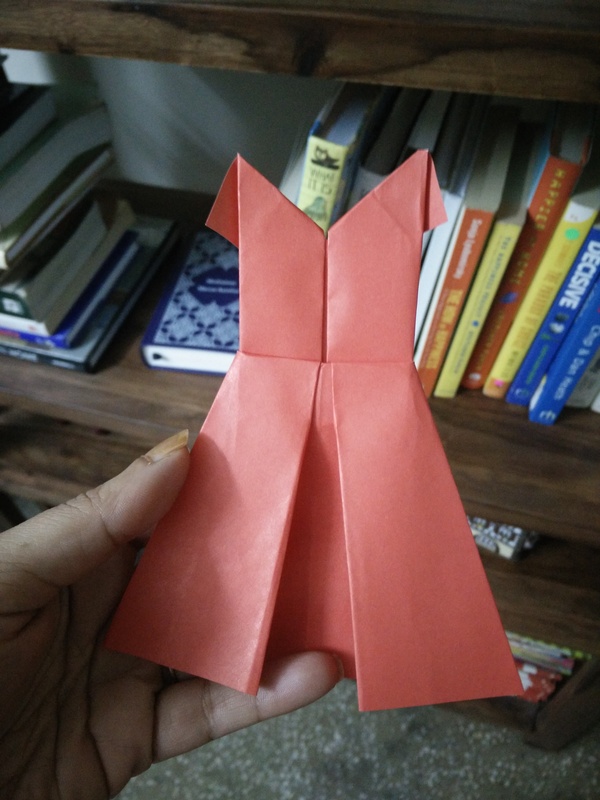 It caught my eye, and I fancied wearing it, and so I made it with my little square of red paper. It was beautiful. Emboldened by my success, I moved on to create a little pink heart that held within it a secret compartment for scribbling messages of love. Creating something is a wonderful feeling. 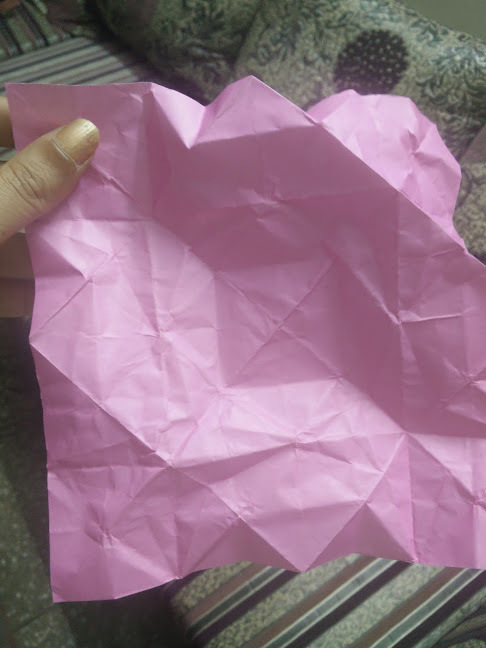 In those moments that I was folding paper, I was in the present; my attention focused on understanding and executing the instructions of the folds just right. I happily showed off my creations to the husband who remarked that whatever else I did, or did not do, I was always up to doing something, which I took as a compliment. A few days later I thought of making something else. As I combed through the list of youtube videos, I came across one on making the sun. The sun has always had a special place in my heart. Yellow cheers me like no other color. The warmth of the sun as I lie on the grass in the park near my house bakes me till I feel like I’m happy and content, fresh out of the oven, sleepy but happy to be alive in this world. And so I set out to fold, one at a time. 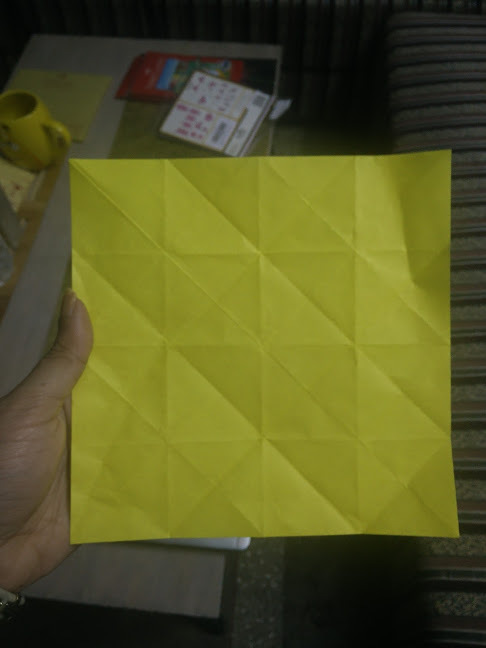 It was a complicated origami, or maybe I lost attention, or maybe both, but I was stuck, and after many minutes of folding I had to give up and call it a day. My showing off the red dress and the little heart to my family on whatsapp meant my sister knew my latest fancy. 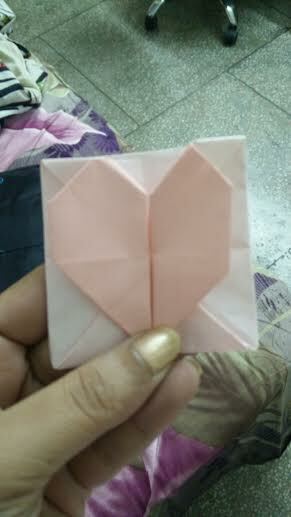 She sent me a video on how to fold a lotus, a thing of beauty that grows even with muck around. I tried creating a lotus, one fold at a time. I didn’t have the level of mastery required, and so once again, I gave up. 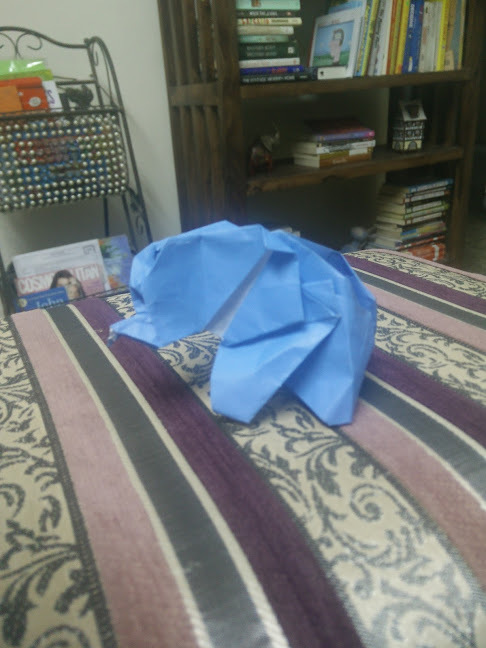 Try something else, I thought to myself, and found myself trying to fold a blue square into a baby elephant at one o’clock at night. I followed through till the end, and this time, I had something. I asked my husband in the morning what it was, and he surprised me by calling it an elephant. That’s probably the reason I married him – he surprises me in wonderful ways. They are all my creative babies: my perfect red dress, my shy pink heart, my sun that was not to be, my lotus that couldn’t grow that day, and crumpled little baby elephant. I love them all. I learned something from all of them, about success, failure, love, striving, and play. I learned that I should play, and pay attention. I learned that all my attempts will not be successful (and that’s ok). I learned that I love my baby elephant even (or maybe, especially?) because it is confused sometimes for a rhinoceros, and sometimes, simply for a ball of crumpled paper. I learned that if I pay attention and focus, I can create beautiful things. And my corollary, if I choose not to gainfully use my creative energies, I can create worries and fears by watering them till they grow beyond my power of control. I learn that the whole day passed, but it is this midnight hour when I am alone, and building, and creating that my heart starts to unwind and starts to sing, ever so softly. < Previous Too much in your head?